9 de Maio de 2017, 11:57 , por Daniel Lenharo de Souza - 0sem comentários ainda | Ninguém está seguindo este artigo ainda. The House of the People (Casa do Povo) received during the days 5th and 6th of May the 2017 edition of Cryptorave, inspired by the global and decentralized action of CryptoParty, which aims to spread the fundamental concepts and basic cryptography software. During 24 hours there were activities on security, encryption, hacking, anonymity, privacy and freedom on the network. The Debian Community was present, represented by the Brazilian contributors Daniel Lenharo and Giovani Ferreira. 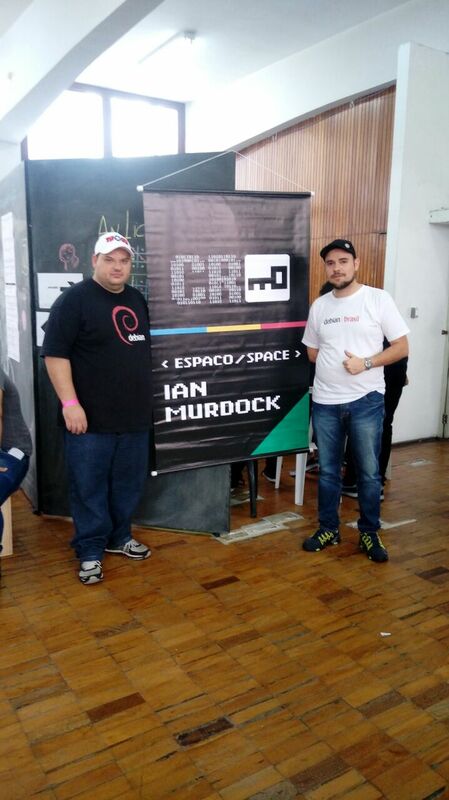 CryptoRave shows affinity with the Debian Project by recommending the Debian GNU/Linux and Tails among the softwares that respects users privacy, and also an tribute to the project's founder, one of the rooms of the event was named Ian Murdock. During the event, in a space provided by the organization, the sale of Debian products (t-shirts, keyrings, bottons, stickers, etc.) took place and talked about the project and finding new people to contribute. 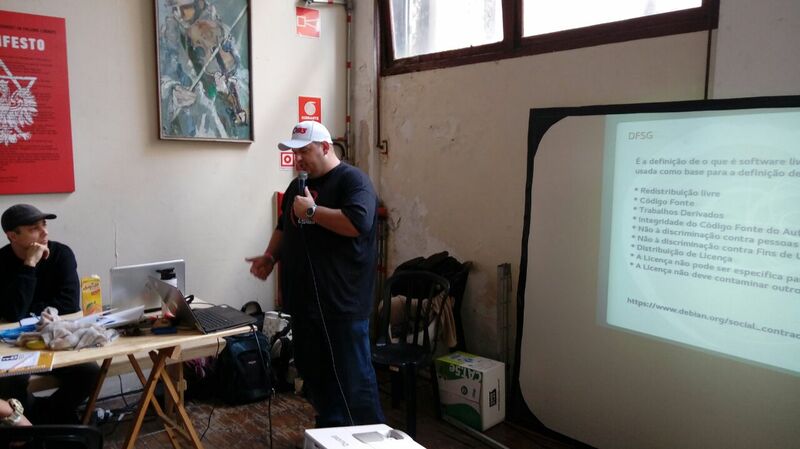 In this sense, Daniel Lenharo held a talk called "The debian wants you" in which in addition to talking about the project presented to the public various ways to contribute to the debian project. "Make Debian present in an event of the importance of Cryptorave is amazing. In these 24 hours we can learn and collaborate in this process of incredible exchange of knowledge that is formed in this event. Also know that our project is useful and people are proud to display Our swirl is something incredible. Surely after the event, we will have more people using and collaborating with our community." Says Lenharo. We thank Cryptorave's organization for the space provided and we look forward to 2018!! Daniel Lenharo talking about Debian. 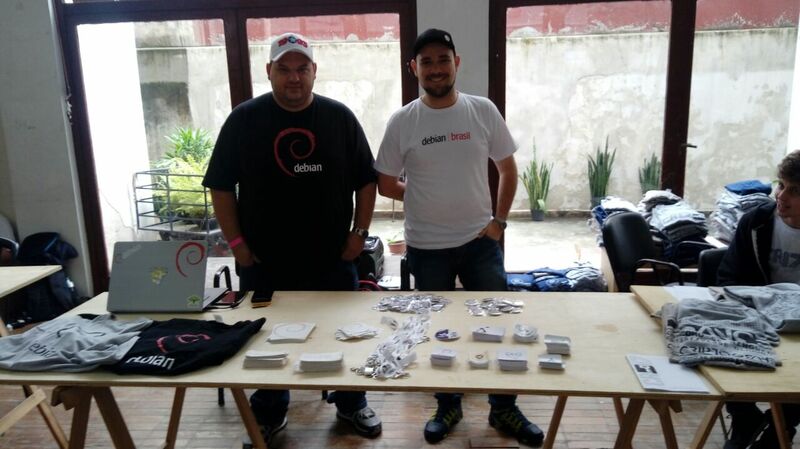 Daniel Lenharo and Giovani Ferreira promoting Debian. Daniel Lenharo and Giovani Ferreira at Debian Project Founder banner.